As some of you might already know, a week ago I released AutoStakkert!2. I thought it might be a good idea to have this thread where people could post feedback and ask question about the software. Let me start by saying that a new update will be released that will be capable of batch processing 'surface' recordings. Here is a short list of the fixes/changes of the upcoming release (if there are more changes, I'll let you know). - Should be more stable now, especially for surface recordings containing bad frames. - Automatically turn off bad frames with horizontal or vertical shifting artefacts (they should have a quality of 0 and be at the end of the quality list. Set TurnOffMisformedFrames=0 in the ini file if you want to turn this feature off). - Speed increase for surface alignment (approximately 30% faster). - Introduced two Surface options: 'Expand' will try to make the very biggest image stack possible, the edges will contain less frames (this was the default option). '100%' will crop the image such that each pixel will contain the same amount of data (the edges should be fine). - File support for large (> 1 GB files, up to 4 GB should not be a problem). 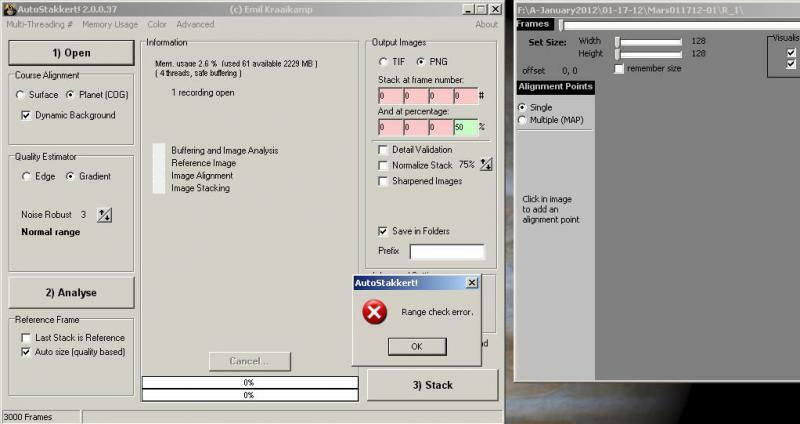 You can still use Castrator before running the images through AutoStakkert!, but the image quality will not be any different one way or the other. - MAP: Multiple alignments (and along with that, multi-core support. So if you have a computer with 4 cores, the program should run about 4 times faster). - It can stack surface recordings as well as planetary recordings. There are two methods of global aligning, one based on the fact that a planet is always brighter than the background and the center should thus be easy to determine, the other will perform a course alignment on surface recordings (for images on the sun, or the moon, or potentially even some deepsky-recordings if you know what you are doing). I haven't really tested the program for moon recordings, but I have found it easily outperforms Registax 6 or AviStack2 on white light solar images. - raw bayer image support (avi recordings: Y800, many kinds of YUV formats - for those who used the wrong codec to store the data - SER frames). Processing is much faster than RGB processing, and no interpolation techniques are used (R, G and B pixels are treated independently from each other, the natural drift in the images will fill in the gaps in the bayer pattern ).The correct bayer scheme is auto detected (but you can also override this if you prefer to). I won't go into too much detail here, send me a mail if you'd like to know more. - Support for SER recordings (thanks to Heiko Wilkens for letting me use his file format!). This includes 8 or 16-bit monochrome recordings, as well as raw bayer recordings. - Support for TIF, FIT and BMP files. Drag and drop one or more folders containing these image files onto the main form of AutoStakkert!2 to open them. - You can view all the frames of a recording. - When the program is used in planetary mode, you can drag the planet around by holding the shift button and dragging the image. Click on the offset number, to reset the offset (it will center the planet again). - Automatic AP placement. This is likely a preliminary version, because it is difficult to do this task automatically. It can place a bunch of APs of a particular size with the brighter parts of an image (there is a simple intensity threshold, which gives no feedback at the moment...). I prefer to manually place APs for images of planets. I will include a couple of examples on how I place the APs in my images. - HQ Refine. Makes refining slightly more accurate (especially for really fine images). Processing will be a bit slower though, but I would leave this option ON for each serious processing efforts. - Drizzling. 1.5x drizzling is nothing but the 3x drizzling reduced to 50%. Drizzling tries to improve the image quality of under sampled (!!!) data. It often does not produce more details, but it might be fun to play around with. Typical drizzling artifacts might occur (blocky pattern), reducing the 3x drizzling back to 50% removes pretty much all of these artifacts (but you could also work with the 3x drizzled recording if you want to. Drizzling makes the stacking phase go rather slow (about 9 times slower.. Aligning does not take more time). - And finally: Unlike Registax or AviStack2, each alignment point does not have a predetermined area that it will represent in the final stack. After aligning and stacking all the alignment points, AutoStakkert!2 uses only the best APs to rebuild the final image stack. A single misplaced AP does not mess up the entire image, data from an adjacent AP that overlapped the same area will be used instead. However, this does not mean that you can simply cover your image will an infinite amount of differently sized APs and an optimal image will always come out. This will not only result in a VERY slow program, it will also increase the chance that one of the poor APs by chance managed to make it to the final image after all. So place your APs wisely, and add a bit of overlap. APs produce the best results if they are placed in such a way that BOTH the X and Y direction can be determined correctly. 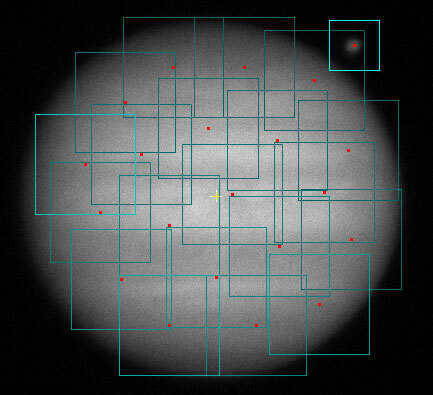 Place a small AP right on the edge of a planet will ensure one direction is tracked properly (perpendicular to the edge), but the other direction will likely be blurred out. One size of APs is usually the best way to go for a specific recording, unless for example there is a small moon visible inside the image, which might be better off with an extra smaller AP. Also, in the case of solar recordings, you might want to replace some of the small APs right in the center of sunspots by larger APs that cover a slightly wider area. Proper stacking takes time. A single alignment point placed around the entire planet will always produce a decent looking image, but it will hardly ever be the best possible stack. If the seeing was absolutely excellent, it might come very close to a multiple alignment stack, but even then there is often a bit to gain by using multiple alignments. You can add alignment points by clicking with your left mouse button inside a frame. In 'Single' mode, you can only draw the APs (left click once, move the mouse to another position, and click once more to place a rectangular AP), but in MAP mode you can also add square APs using a single mouse click. Use the right mouse button to remove the closest AP, and the mouse wheel to change the size of the APs you want to set. Details in the image are aligned on a reference image which is simply a small stack of the best frames. You want this reference image to be representative for the entire recording, and contain little noise. A single frame is always a poor choice for a reference image, as it is usually slightly distorted and thus the final stack will also be slightly distorted. Also, a single frame is often too noisy to align on. "Last stack is reference" tries to use the last stack as a reference frame (IF that last stack is available, and has the same size and same offset as the current recording, otherwise it will simply create a new reference frame). - Click analyze, en look at the ordered list of frames to see how well the currently quality estimator does its job. - Determine how many frames you want to stack. - use Multiple alignment points (MAP) and place around 30 APs with a size of around 80-120 (depending on the image scale and image quality). If there is a small moon or shadow visible, you can add an additional smaller AP around that. - Determine how many frames you want to stack. If after the best 500 frames the image quality drops, it will generally NOT be a good idea to stack the best 1000 frames. - Click Stack, to make stacks of all open recordings using the APs that you placed. A cancel button also becomes clickable just in case you made an error. - Edge detector often works well, I would turn it off for the shadow side of mars, because it is more difficult to determine the quality there. - If the images are really good, you might also try the gradient quality estimator. You'll have to experiment. If you use edge, every AP will use the same subset of frames to stack, in gradient mode all APs use their own subset of frames. - Single or MAP, if Mars is big enough (> 8"), an MAP alignment should give you more detail. Add enough overlap between the APs, and use an AP size of about 8" x 8" to get you started. A smaller AP placed around the polar cap, and/or two placed near the edges of the polar cap, might be a good idea too. - The recordings often contain VERY little noise and are made with short exposure times. The gradient quality estimator can incorrectly see the seeing bubbles as extra details, so you might be better of using the edge quality detector. - If Venus has a crescent shape, I would definitely use MAP. Place one AP on each pointy end, and add a couple more APs around the center (large enough so you see a bit of black space on either side of Venus, as it is pretty impossible to stack on features on Venus. - Always use gradient quality. A small value of 2 works best for my white light recordings that contain no noise and were shot at F/15. If you use a larger image scale, I would use a value of 3 or 4. - The size of the APs greatly depends on the image scale and the amount of noise visible. I can use the smallest APs on my low noise data recorded at F/15 (with a 5.6x5.6um camera), but I would start off with larger APs (do a run with 100, and decrease the AP size in the next runs until you don't see an increase in the image quality). - Use the button 'Place APs in Grid' to add APs. - Have a look at the Analyzed frame before placing the alignment points!!! In my recordings of the sun in white light, the quality often drops very fast. Don't stack a lot of frames if only a few of them are good enough, but if you are lucky to have steady seeing, stack more frames. So, if you have any questions on how to process your recordings, just ask them here. If you run into serious problems, please send me an email as well. Some ideas to place alignment points. Saturn can be a bit more difficult to process. DON'T use automatic AP placement, but place the APs manually instead. An AP is only strong if it can track features in two perpendicular directions (AS!2 favours x-y directions, but it can also be diagonal or anything in between). Most important lesson: experiment with different APs! >Any chance you will add other formats besides avi and ser to the software. I use bmp because it gives me so much more control over the raw images. We just shot here in France some fine Mars movies for trying AS2. Well what can I say. I've been a loyal & devoted die-hard Registax fan for years but after trying this software, I am sold! Got a better stack the very first go than what I know I can squeeze out of Registax! Sean, I will upload the new version later (tomorrow probably, perhaps within 12h if I get the chance to test it properly). The notes were just to let you know I have been working on those issues, but they need to be tested before I put it online. Ah, thanks. It's working great on my Win7 32-bit machine. The only videos I've needed to manually place alignment points on are my UV venus images, because the background is so bright and noisy. Thanks, I'll try it out and see. Dragging and dropping a folder with bmps didn't work (apparently). The screen capture is below of the error. Windows XP Pro is OP. System locked up and had to ctrl-alt-del to close the app. I downloaded it. When I went to unzip it, I got a message to the effect that it coldn't read the timestamp? hat's ok because then looking at my desktop where I installed it, it works. I thought I would try my 5 Gig file of Mars I did the other day which will not work with my Registax6. My captures are recorded with a DFK21AU camera onto a Windows XP 32 bit computer. The .avi file is then transferred to my Windows 7 64 bit machine. The problems saying that Registax cannot load the file. In Autostakkert!2 I get the message "Invalid codec DVSD (1685288548)." So it appears I will always have to use Virtual Dub to convert the file first and then process them. Also, I understand that you're still in the evolutionary process with this, correct? For instance, I still need to use something like Registax to still apply the wavelets? No idea about the message of the timestamp, seems to be something in the unzip software, so I'm not touching that one. What software do you use to make your recordings Len? You should select an uncompressed format to save your recordings (you could use raw bayered recordings with the Y800 codec, or just create a bsic RGB24 avi video). DVSD does not sound like a good codec to use for astronomy imaging. >Also, I understand that you're still in the evolutionary process with this, correct? Not really, AutoStakkert!2 is not and will not be about image processing, it's only about aligning and stacking images. So it will NEVER incorporate image sharpening routines, mask functionality, noise reduction, deconvolution, color enhancement, etc etc. Registax can do a bit of that (perhaps enough), Photoshop/GIMP can do a lot of that (likely enough), and there are plenty of other software packages that can also do specialized bits of that. Paul, I'll look into that. Could you provide some details about the images in the folder (how many, size, type of BMP, can you upload a BMP for me??). I just opened a folder containing 3000 BMP files without a problem on my Windows 7 computer. I love AutoStakkert!2 !!! As soon as I have more time I'd be bothering you with a couple of questions(I have tested it already and have some great results). By now, I can only say THANK YOU SO MUCH for such a piece of software, and for taking care of our questions and experiences on the program with this useful thread!!! Let me start by saying that a new update will be released that will be capable of batch processing 'surface' recordings. I was just sitting down to email you about this! I'm really looking forward to being able to just press "stack" and come back in the morning. It will make those 50 AVI nights (like last Friday ) a lot easier to get through. As I mentioned in Glenn's Mars thread, I've found that AS2! gives slightly sharper results on my lunar AVIs than AviStack2. (And R6 won't run some of my AVIs at all until I convert them via VirtualDub - I have no idea why not.) This is the case even though I don't pick alignpoints - I just have AS2! set out a grid. Works fine so far. Thanks again for the great program, Emil. With regard to the capabilities...just aligning and stacking, yours is the best! I am re-processing all my Jupiter images that I took last month. So I will just use my Registax 6 for the wavelets and the final processing with my Adobe Photoshop CS5. Around here where I live, we almost never have a stable atmosphere...thanks to the jet stream. Ok - if you reckon it's worth trying John I'll give it a whirl.....obviously with Emil's comments about bmp's (and/or more importantly Paul's that it doesn't accept them) there's absolutely no need to bother about pre-processes like Vdub & ninox either - he'd most probably tell us to use Castrator anyway.....hmmm, maybe that's his game, monopolise nearly all processing and then start charging everyone once they're almost totally dependant upon it..! Turns out that AutoStakkert will handle bmp's after all....well almost anyway. Like Registax, you have to drag and drop them onto the software. Emil and I have found a couple of glitches, but once Emil gets that worked out it should be good to go. So far I have only one avi file to play with so I'm anxious to get testing in earnest with my bmp captures. Personally I think a program like Ninox is always beneficial with any stacking program. One reason why I'm so adamant about using bmp's for my capture. I've always like the quality estimation in Ninox. In fact Anthony was one of the main drivers in getting better quality estimators into Registax. Autostakkert has always been good in quality estimation and now that Emil has added an edge estimator as well its hard not to keep Autostakkert at the ready. For reasons somewhat mysterious, sometimes one program will excel with a certain dataset whereas another one will the next day. Indeed some datasets will provide a better stack with single point alignment, just another mystery - but one can think of reasons that might be. Obviously without trialling it yet I can't give any personal "druthers" but it's certainly worth "giving a whirl" as I will today sometime: those comments of yours here Glenn are why I'm allways a bit reserved about any claims of immense superiority of one program over another most of the time (especially when dealing with such established and developed ones like Reggie or Ninox) - a lot of subjective hype can blur our initial appraisals, and as you say, different captures can respond differently and skew one's comparisons momentarily. Hi guys. 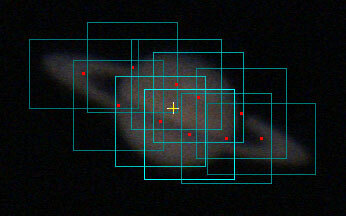 I'm finding that AS2 is better than Registax at aligning data in seeing of 6/10 & below. I've done a few stacks now & done the comparisons & that's what I'm finding anyhow. I'm not finding much of a difference between the two in above 6/10. As far as speed goes, I'm still finding Registax slightly quicker, but then I'm doing BIG Debayered OSC AVI's - Hell of a difference from mono RGB data. I don't think Ninox is worth applying tbh, but most of the time it shouldn't hurt either. Ninox registers the image quality globally, so it will give a quality number to each entire frame. Which is usually fine for really small targets. The edge quality estimator in AS!2 also works globall, which mean that each AP is going to use the exact same offset of frames. When working in gradient mode in AS!2 (and also in Registax 6 and AviStack 2), for each AP a separate quality estimator will be used. This means that AP-1 at the top left of the screen will likely have a whole different set of frames to stack than AP-100 at the bottom right of the screen. Especially for bigger targets it could be bad if you already pre-selected the best 50% of the frames, as they might be the best overall frames, but not necessarily the best for the top left or bottom right location! The bigger the target, the less strict you should pre-select. Glenn, the edge quality estimator has been there since version 1 actually. Not much has changed in the quality estimation algorithms. I have not found a recording where SAP gave better results than MAP, for me it has always been at least equally good. Under really steady conditions, MAP might give hardly any improvement though, but that is in the nature of really steady seeing. If MAP produces worse results, it's a good indication the AP points should probably be bigger, and or placed at different locations: for example, a diagonal line - like a zoomed in ring of Saturn - is NOT a steady point to place an AP. It can track well in both X and Y, but there will be a lot of blurring in the direction of the diagonal line. To make sure that blurring in the diagonal direction won't happen, you should place the AP such that there are features that 'block' that diagonal movement: make sure the other side of the ring is within the FOV, or relocate the AP to include a perpendicular feature like the edge of the planet, or the black space at the tips of the rings. ). Darryl, you are absolutely right. Just try it out, and try to understand how the program works. If it works well for you, excellent, if it doesn't, try again (yes, you ould get get stuck in an infinite loop this way haha). But I think it will work fine. John, AS!2 can also handle undebayered recordings, and it will actually be MUCH faster and should also be sharper (as it doesn't use any per frame linear interpolation mechanisms which tries to guess missing pixels, it basically uses a type of drizzling which fills in the missing pixels on the fly). At the moment buffering the entire RGB frames is not supported, and it won't be supported anytime soon, so it will have to read from your hard disk more, making it slower.